Ray Wilson has been interested in analog synthesizers since the first time he heard “Switched On Bach” back in 1968. After working at U.S. Steel, Intec Systems, Siemens Pacesetter, and Telectronics, he now runs his popular web site Music From Outer Space (MFOS) full-time. Most of his electronics learning has been hard-won and experiential, with hundreds of hours devoted to reading, breadboarding, experimenting, and appreciating analog synthesis. Ray presents a free, one-hour webcast on the topic, ‘Using TL07X Op Amps in Analog Synthesizers,’ on Thursday, Nov. 14, at 10am PT. 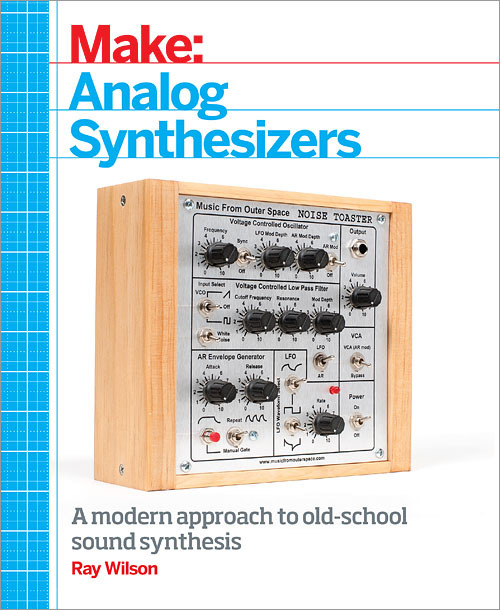 Ray Wilson: ‘MAKE: Analog Synthesizers’ is written for electronic hobbyists who want to explore the field of analog synthesizers. People need a smattering of exposure to electronics (or at least an interest in it) to benefit fully from the book. I tried to provide intuitive explanations of circuit theory that appeal to beginners, but are meaty enough to benefit more experienced enthusiasts. A newbie can buy it and immediately benefit as well as grow in knowledge by studying the more advanced sections and chapters. What need does it fulfill for those readers? RW: First of all, it legitimizes synth-DIY. Tinkering with circuits to make noise is actually an art form to many people, and I completely understand why. It really is satisfying to build up a project and then use it to produce some form of sound-related art, whether it’s a public art installation with which people interact, or your own personal noise box, keyboard, or full-blown modular synthesizer. • What are the modules in a modular synthesizer and how do they contribute to its unique sound? • What bench instruments do I need to get started? • What components should I have on hand for experimentation? • How can I improve my soldering? • How do I use my computer as a multi-track recorder? • What are op amps and how do they help me in my synth-DIY work? What’s the most exciting and/or important thing happening in your space? RW: The creativity explosion taking place around the world is amazing! MFOS has a base of supporters that is earth-wide. Check this out to see a sampling of what’s going on in place after place. Here people in Estonia are having a NOISE-IN building a bunch of MFOS Weird Sound Generators. Seeing synth-DIY and creativity in general at work in people’s lives is extremely gratifying. That, to me, is the most exciting thing that the creativity wave from synth-DIY helps to generate and sustain.